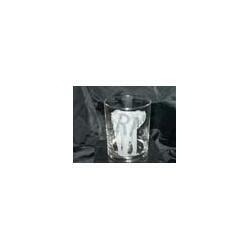 Whether you are accessorizing your bar or looking for a great gift, this crystal old fashioned glass is a piece of art. 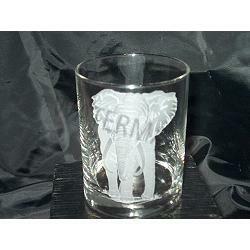 The elephant image is hand carved from the artist's original sketches. The multiple carving levels on each piece of glass adds a depth that makes this crystal come alive. Each piece is signed by the artist. Other images available upon request. Collect the whole safari theme. Great wedding gifts. Made in the USA. 14 oz. Approx. 4 in. tall.